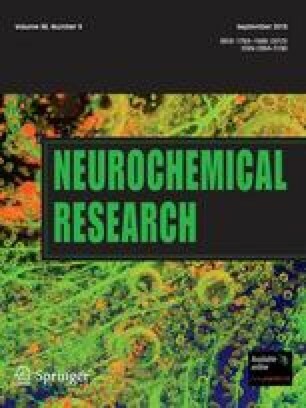 The present study examined, in mice, whether regional patterns of brain monoamines concentrations (DA, 5-HT and their metabolites) and expression of c-Fos protein, that may represent a prolonged functional change in neurons, could be changed after a combined exposure to stress and the peripheral cholinesterase reversible inhibitor pyridostigmine (PYR). Animals were subjected every day to a random combination of mild unescapable electric footshocks and immobilization over a 12-day period, resulting in a significant increase of glucocorticoids levels and an activation of c-fos in hippocampus, thalamus and piriform cortex. This stress protocol induced a significant increase of 5-HT levels in striatum, hippocampus and ponto mesencephalic area (PMA) but failed to induce any DA activation. When PYR (0.2 mg/kg s.c. inducing 19–35% inhibition of the plasmatic ChE activity) was administered twice a day during the last 5 days of the stress session, 5-HIAA levels and expression of c-fos oncogene were significantly increased in the most of the brain areas studied. DA levels were also enhanced in striatum/hippocampus as a result of a possible activation of mesolimbic and nigrostriatal dopamine systems. Taken together, these results suggest that a combined exposure to certain stress conditions and PYR leads, in mice, to functional changes in neurons and may affect centrally controlled functions. The mechanisms underlying these modifications and their behavioral implications remain to be further investigated.